I’ve been asked a few times to share more about how I do things in my business-what are my process, so this is the very first Processes: A Peek Behind The Curtain post. 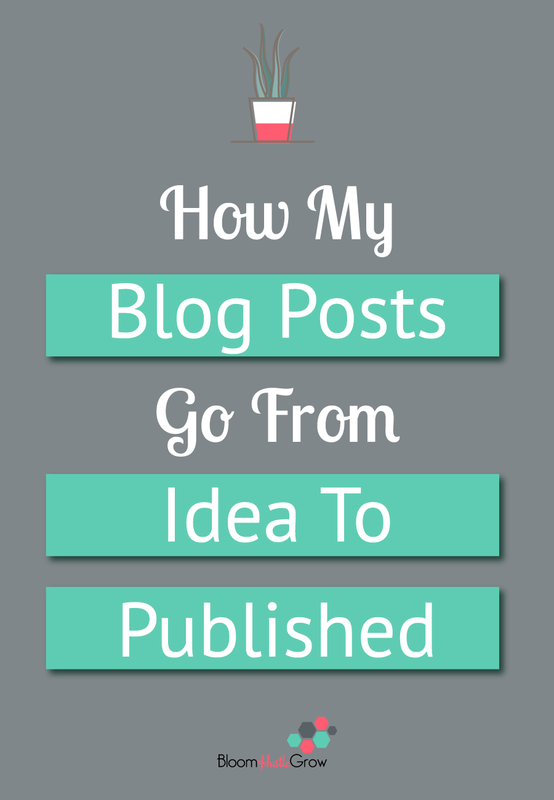 I decided the perfect one to start with is how posts just like the one you are reading, go from idea to published. This is the step by step process of how I craft a blog post. It does not include the planning that tells me what idea I pick nor how I reuse/recycle content. And if you are creating blog posts then you better me reusing/recycling that content, so read this blog post! I’m not saying my process is perfect, but I wanted to give you a look at what the process looks like and encourage you to document your own blog posting process. I don’t necessarily do this schedule as one, two, three days (Monday, Tuesday, Wednesday) I like time between drafting and finalizing to let it get out of my head, it makes re-reading easier. But I typically work on these parts of the process in the same blocks of time. So I might draft on Monday, graphic and headlines on Wednesday, and then finalize and schedule to publish on Friday. Keeps it all organized and stores the steps to this whole process, I’ll show you examples below. Keeps my writing like it’s written by someone who knows English because I don’t understand how commas work. Is where all the words are born, aka drafting blog posts. Headline/title feedback, because titles are hard. Blog post and social media graphics. Is what shares it with you! Blog post promotion on social media. It’s impossible for me to write a blog post from draft, to graphics, to posted in WordPress and published in one sitting or even in one day. I have to break it down into steps. There is always some little mistake or typo I find months after publishing when I glance back over it. I’m actually pretty good at catching errors in other people’s copy, but not my own and I’m best at it when I’m not looking for it (useless skill). I only try to draft one to two post in a day, I wish I could batch my draft writing, but my brain does not like to do that. Ideas linger. So at most one in the morning and one in the afternoon. All my posts start as a draft in Google Docs. 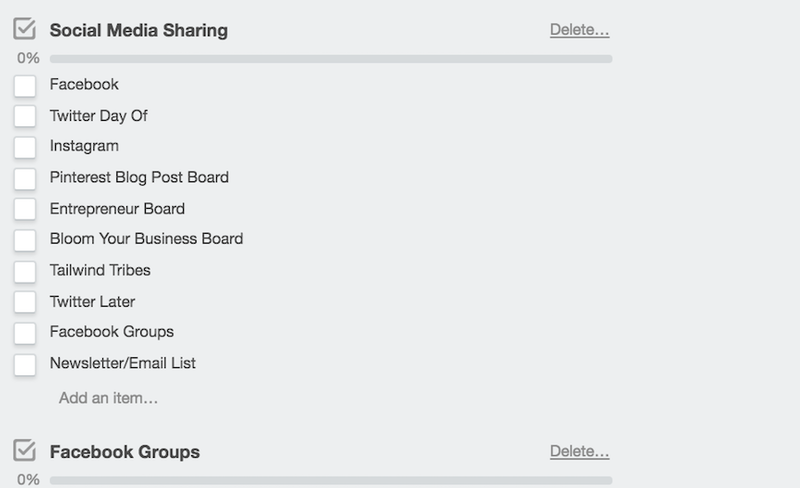 I pick my topic from my Trello ideas list in my Blog Editorial Calendar Board. I open a new document in Google Docs. Draft what I can, it totally depends on the day and the blog post how many Pomodoros I need to draft a complete blog post. I tend to do the 25 minutes and then keep going instead of breaking, and break when I’m finished or run out of steam/focus. Some days I can tell I’m not feeling it, so I do my 25 minutes and move on to something else. Copy my Trello blog post card template, create a card for this new post, attach the google doc to the card, set a publish due date, delete old idea card. Below is my template card. Copy and paste using command A to highlight the whole document, then paste in Grammarly, check for spelling, passive voice, repeating words and other grammar mistakes. Yep, I pick it after; I’m sure this statement is making some SEO experts red in the face. The proper order (and this is where do as I say, not as I do comes in) would be to pick your SEO keyword first so you can work it into your writing. I’m 100% sure your writing would be more SEO friendly if you knew the keyword and frankly the title you were writing for. I add the chosen keyword into the Trello blog post card. There is some advice that encourages you to write your title first to guide the post, but that’s not how I roll. I write 10-20 titles in the top of the drafted document. I do typically look over my adjectives sheet and make sure at least a few if not all have the keyword. I play around with it. Pick a title; sometimes I use one title for the WordPress title and another for the graphic title. It just depends on my mood. Most of the other titles I turn into Tweets. 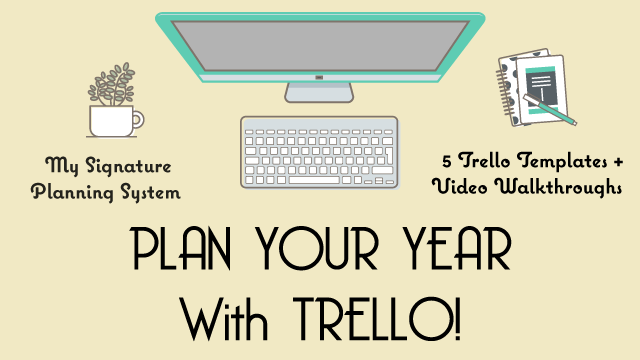 Update the Trello blog post card with new title. Once the title is chosen, then I create graphics using Photoshop. Scroll through my mess of pictures and pick one or two to try out as the background. Update templates for the vertical graphic that I use for both Pinterest and in my blog post, a Facebook graphic, and an Instagram graphic. 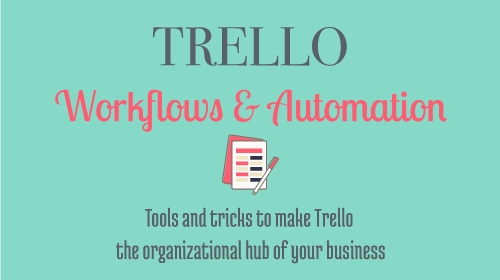 Attach the main blog graphic to the Trello blog post card and make the cover (this step is solely because I like to have that visual in my Trello board). Open the Trello card, open the attached Google Doc linked in the card. Re-read the blog post in Google Docs. I try to read it out loud, but if I’m lazy I read it silently but slower. Copy and paste the text back into Grammarly for a second run through. Open a new WordPress post, copy and paste my chosen title from the Google Doc. Copy and paste the edited text from the open Grammarly window into WordPress, but I always do right-click, “Paste & Match Style.” Otherwise, the formatting can be quite funky. Side-note: I could cut and paste into my WordPress post and use Grammarly inside the post, and save a step. However, I find it runs a bit slowly and like doing it straight in Grammarly and I just take the extra 10 seconds to cut/paste. Add in the main graphic, making sure to at the minimum add in the title to the alt title in the graphic. 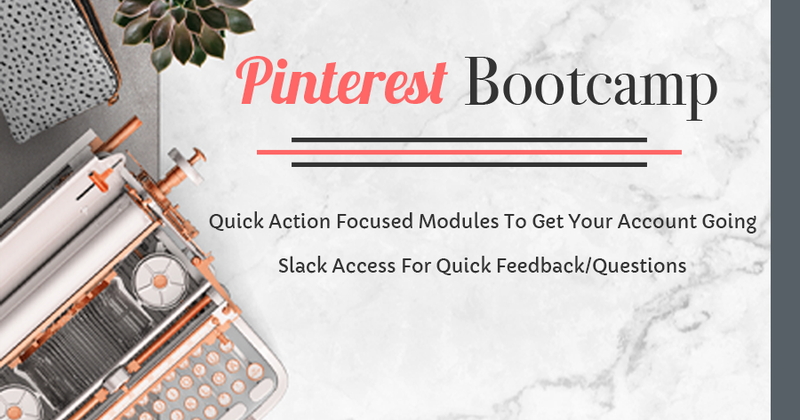 A sentence or two is even better, that is where the descriptions for your pins pulls from when someone pins from your site to Pinterest. Go to the Yoast SEO plugin, add in the horizontal graphic for the Twitter & Facebook tabs again with a good alt title. I use the same Facebook sized graphic for Twitter & Facebook. Add in the keyword, edit the meta data, check the slug. Add the featured image, add the tags, check the categories, and then change the publish on date. Format for headers, bullet points, add in links, CTA (call to action) or other pictures/graphics as needed. Side-note: The CTA (call to action) process that includes a download is a sub-process and has it’s own set of steps that involves Convertkit. Add a click to tweet, usually one of the not chosen headlines from the draft. Preview the post, re-read it one more time, command A to highlight the whole post, delete out the draft post in the Google Doc but keep the titles + headline analyzer screen shot, then command C to copy and paste it below the headline analyzer in the Google Doc. 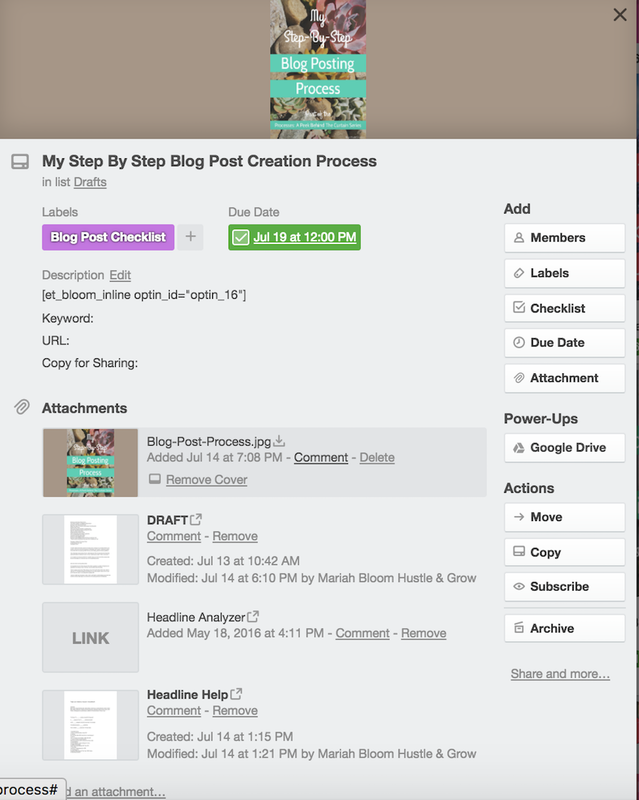 Grab the shorten URL and the long URL, put into Trello blog post card. 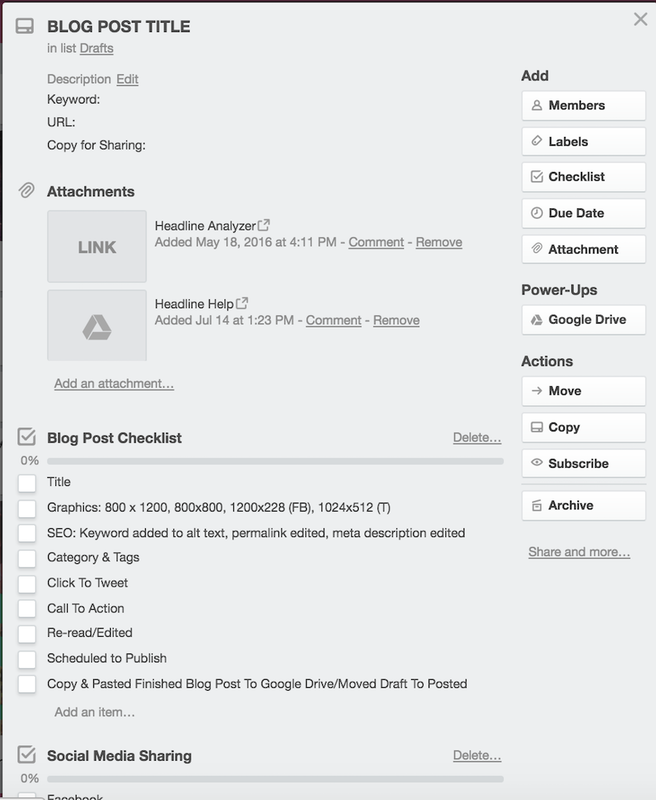 Schedule in for the publish date social media posts, Buffer for Facebook/Twitter, Later for Instagram. Day it publishes, pin directly to my Bloom Hustle Grow board on Pinterest. Then from there, I schedule it using Tailwind into my various other boards. The card is then moved over to the published Trello list in the editorial calendar. The card is used to continue sharing the post on Twitter, Facebook, Facebook Groups, Pinterest Groups, etc. I continue to circulate that post throughout channels after the publish date and use the associated checklists to keep track. Below is a checklist for sharing, but there are two additional checklists Facebook Groups & Pinterest Group Boards also on the same card. 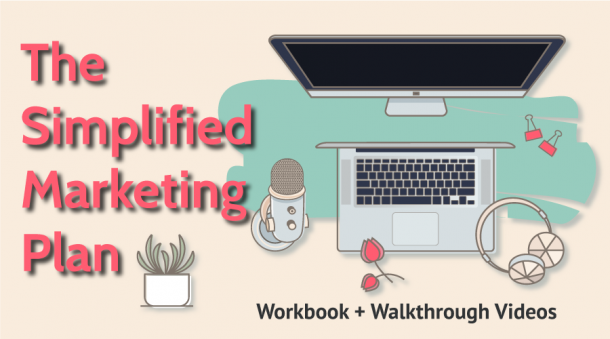 ❏ Write* down all the steps to your blog (or podcast, video, etc.) process (or processes). *I actually recommend typing it so you can easily edit it in the future and hand off to a VA as instructions. ❏ Then create a checklist. You can do this in a document, in Trello like me, or in another program you use (like Asana, etc). It allows for consistency each and every time you create a blog post; you don’t forget a click to tweet or to add your alt title. Consistency also allows you to train your brain, so it becomes a habit/routine chore. Much like if you use to drive between home and work without really thinking about your route. This allows you to do the whole process quicker and with less mental fatigue (except maybe the writing part) because you don’t have to “remember” the next step from thin air and you follow the same order. You have instructions if you ever hire a VA (virtual assistant) to help you. Plus it makes it easier to identify steps you could outsource in the first place. And not just a VA, you can outsource the different steps to different qualified people. You can more easily identify areas you could improve upon (like my neglectful SEO practices) or areas you might be able to automate or make more efficient. Some of the above links are affiliated, if you sign up using the link then I will get a small payment or free service. No additional fee to you.